The Dunlop Silk 1.22mm squash string - 200m reel can be used for re-stringing and improving performance of many rackets. As its name suggests, the Dunlop Silk string provides a feel that is as smooth as this premium material. It also delivers an outstanding power and comfort while playing and has a construction incorporating a DuPont PA66 multi-filament central core, fibres bonded with thermo elastic PU resin and a super bonded polymer outer coating. This multifilament squash string has a diameter of 17 (1.22mm) and is available in a 200m (656ft) reel. for submitting product information about Dunlop Silk 1.22mm Squash String - 200m Reel We aim to answer all questions within 2-3 days. for submitting product information about Dunlop Silk 1.22mm Squash String - 200m Reel. We aim to answer all questions within 2-3 days. If you provided your name and email address, we will email you as soon as the answer is published. 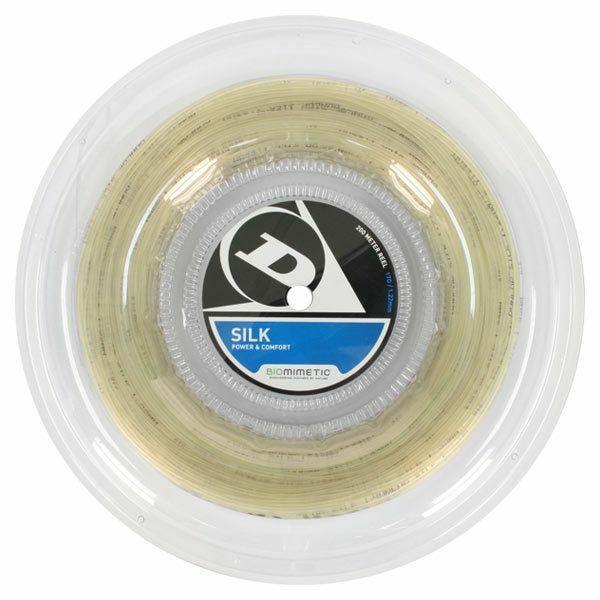 for submitting product review about Dunlop Silk 1.22mm Squash String - 200m Reel.